A Cardinal Coach Line bus en route to a casino overturned on State Highway 161 today killing two people on board and injuring dozens more. 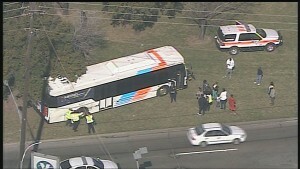 The bus tipped onto its passenger side just east of Dallas Fort Worth airport in Irving, Texas. 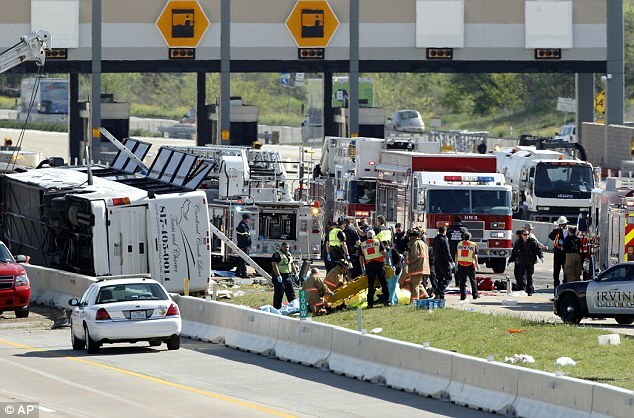 Dan Risik, a passenger on the bus, told KXAS that passengers in the bus were screaming and had been thrown on top of one another during the crash. 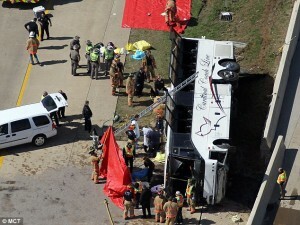 The bus was heading to Choctaw Casino Resort in Oklahoma; Risik reported that many of the injured passengers on the bus were elderly folk. 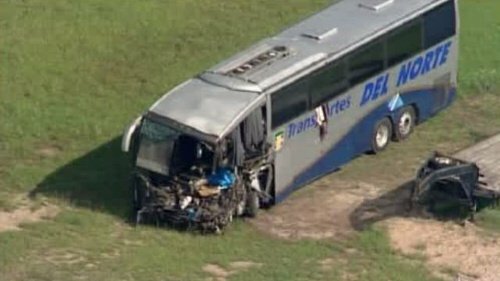 According to a report in the Mail Online, the Texas Department of Public Safety has not yet determined the cause of the bus crash. 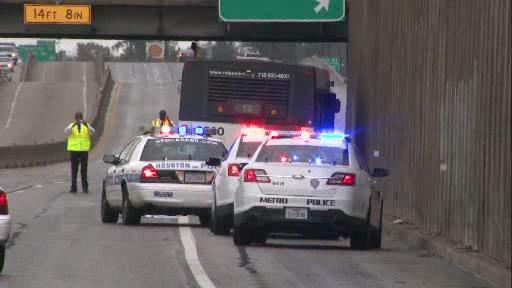 Six people were taken to the hospital this morning when they were injured in a collision between a METRO bus and an 18 wheeler. The accident happened on the South 610 Loop frontage road at Scott Street at about 9:30 a.m. 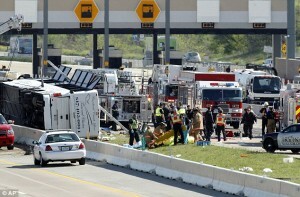 The driver of the big rig, the driver of the METRO bus and four bus passengers were injured. 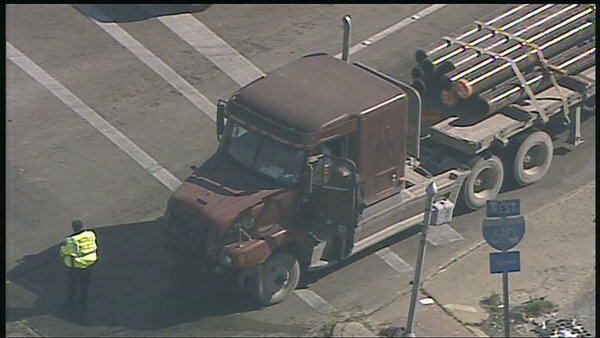 According to Channel 11, Houston police later said the driver of the 18-wheeler would be given a citation for running a red light and causing the accident. 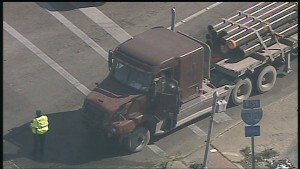 The 18-wheeler was hauling a load of pipe; the bus sustained damage down most of its passenger side. 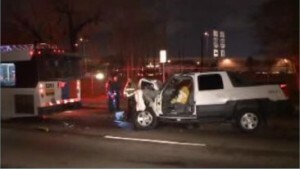 The driver of a Chevrolet Avalanche pickup truck was injured Saturday night when his truck rear-ended a stopped METRO bus on the Highway 59 feeder at Fountain View. Police said the driver told them his accelerator was stuck when he crashed. The man was rescued from his badly damaged truck and taken to the hospital to be treated for his injuries. A couple of the bus passenger were hurt but will be okay. Channel 2’s story here. Have you been injured in a rear end accident? Rear end accidents are usually, but not always, straightforward. Contrary to what many people think, there is NOT a law in the State of Texas that automatically faults the rear vehicle in every rear end accident (there is a law that requires all drivers to maintain a safe following distance, but that is not the same as automatic fault). If you were rear ended by another driver and are hurt, call the experienced personal injury attorneys at Smith & Hassler for a free consultation. Smith & Hassler has represented injured Texans since 1989 and four of Smith & Hassler’s six attorneys are board certified by the Texas Board of Legal Specialization in Personal Injury Trial Law. 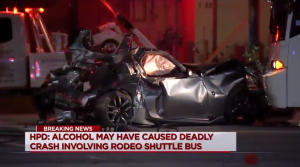 A man died Sunday afternoon on Interstate 45 North near Main Street in Houston when struck by a METRO bus as he stood near his car after a previous accident. 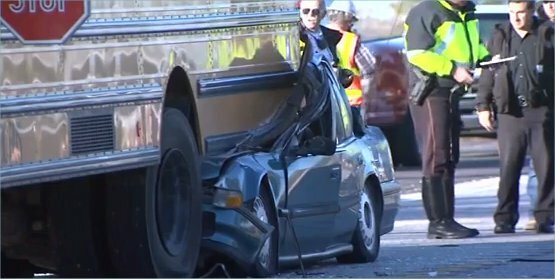 METRO officials say that shortly before 1:00 p.m. a car had stopped on the freeway with a flat tire, which caused a four vehicle collision. 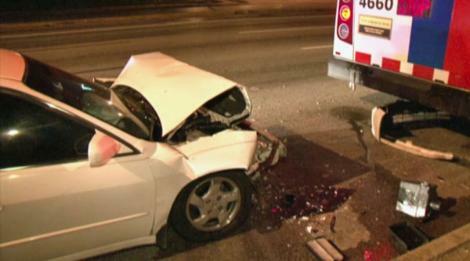 The METRO bus swerved to avoid the accident but hit the man who had gotten out of his car. The man was pronounced dead at the scene. Four people were transported to St. Joseph’s with non life threatening injuries: including a bus passenger who was treated for cuts to his face. Channel 2’s story is here and tells the facts somewhat differently: that the man’s vehicle stalled in the center lane of traffic and he was hit by the METRO bus and at least four other vehicles as he walked down the freeway. The Chronicle’s story is here. 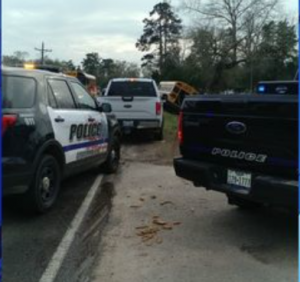 A driver was killed in a Wednesday morning collision with a Waller Independent School District bus. The accident happened around 6:20 a.m. on FM 2920 at Becker Road west of Tomball. A green-colored sedan, possibly a Honda Accord, rear-ended the school bus as the bus was stopped to collect some children at their stop. 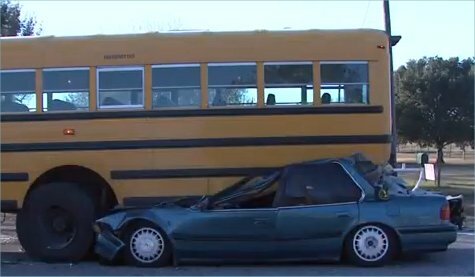 The sedan went beneath the rear of the school bus: the driver was pronounced dead at the scene. The children on the bus and the driver were not hurt. According to a Channel 11 report, a man and woman were arguing right before their car smashed into the back of a METRO bus waiting a stop on Westheimer at Briarpark in Houston. The crashed happened around 12:45 a.m. The man and the woman in the car were taken to the hospital, as were four passengers on the bus.